This past Easter long weekend, we flew to Calgary. It was my baby's first flight and surprisingly, she was doing really good! She did not cry, fed her once, fell asleep when the flight departed! After we had arrived the Calgary airport, we went to pick up our rental car. Dropped by to visit two friends at Calgary and then headed to Banff! It's been 6 years since we last visited there and the scenery was still breathtaking when we entered the Banff area. We went to Grizzly House to have lunch. A lot of people saying that their fondue and hot rocks dinners were really good. My hubby tried an exotic meat hot rocks dinner but as I expected, it's not really exceptionally good that you "must" try it when you were at Banff. Then we headed to check-in at the Fairmont Banff Springs Hotel. A very nice hotel and we got upgraded to a deluxe room. The view was beautiful! From our room, we got the full view of the mountain!!!! Everyone was very excited! We then drove around and took some pictures and then went back to the hotel to walk around. 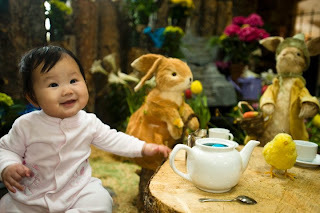 There were a lot of activites for children and probably few years later, I will bring my baby back to Banff during Easter so that she can enjoy the children activities offered by the hotel, like Easter egg hunt, bunny story time etc. The next morning, we tried the famous brunch at the hotel! It's really good and it's totally worth the money that you paid for the brunch. But need to be sure you made a reservation, since it's always very full there. After the brunch, we drove to Lake Louise. Since the weather was not really good by the time we arrived, we simply stayed inside the Fairmont Chateau Lake Louise hotel. Again, we got upgraded to a room with lake view. Although Lake Louise was full of snow, but it was very beautiful. We went to enjoy the pool and whirlpool inside the hotel. Really relaxing! The next morning, we went outside to take some really good pictures. Time passed so fast that we did not even realized it's almost two hours that we were there! It's not as cold as I thought (since I saw on the weather report that it's -10 degree outside!) 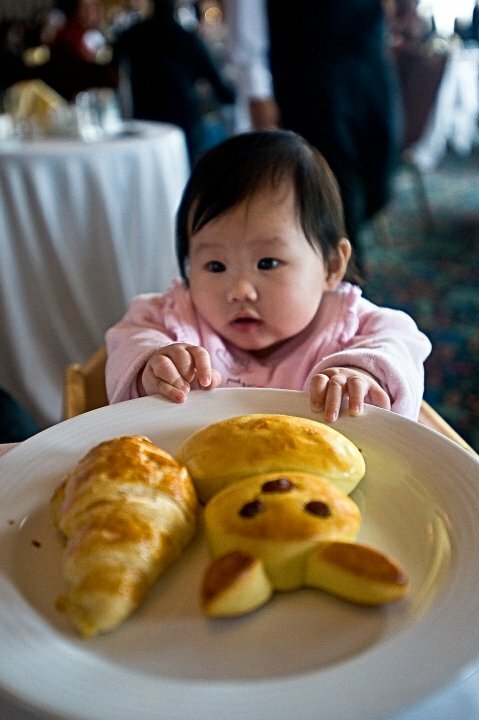 We were so lucky that we were able to make reservation to try their Easter brunch. The restaurant itself and the scenary outside the window was better than Fairmont Banff Springs but in terms of food, I still prefer the brunch at Banff. It got a lot of different Easter decoration, like ice scruplture, chooclate scruplture, bunny sweet treats, bunny bread etc. I was so excited to see all these!!!!! After the brunch, we loaded all our luggages into our rental car and then we drove the Hwy 1A for some scenic viewing and then headed to the airport. This mini getaway was fun and I am looking forward to my next trip to Miami in two weeks!